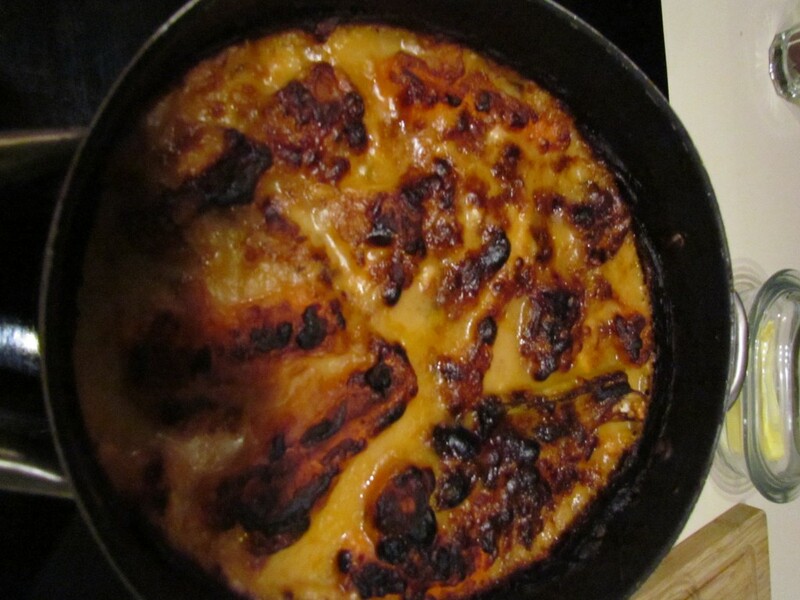 On my birthday this year Alfonz treated me to a traditional French Cassoulet in St. Jeans Minervois paired with the local Muscat. Now, there are different villages in a triangle around Capestang whom all claim to be the origin of Cassoulet. They all have variations on the recipe. 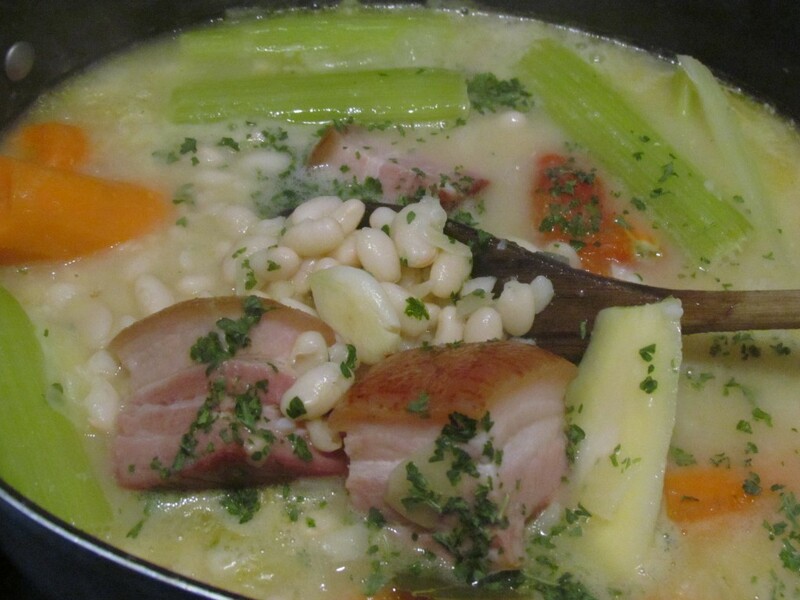 Cassoulet is white beans baked with sausages and duck confit. It is rich, comforting, with a smooth texture. People always say that it takes days to make this deadly delicious meal. I decided to see how hard is it to actually make? You can buy cassoulet in cans just like baked beans back home. Occasionally, I will buy it at the local supermarket, warm it up and serve it with fresh bread from the local baker and call it dinner. This variety is more like beans in gravy and there are pieces of duck and sausages throughout. It is very tasty, I mean how can it not be? Duck cooked in its own fat, slowly baked in beans. When I visit my family in hungary, I bring enough for everyone to try the flavours of France without having me to cook. It is unanimous, everyone children included, love this dish. In the restaurant the beans were drier, and the duck fat was hot and clear. A slight taste of tomato was present and the colour was opaque paprika. The meal was rich, but not as rich as the canned variety. The duck confit was made on site, done in the traditional method of the town. People would come from all over the world to try this dish in this restaurant which was once a school house. The meal was memorable, decadent and cozy. 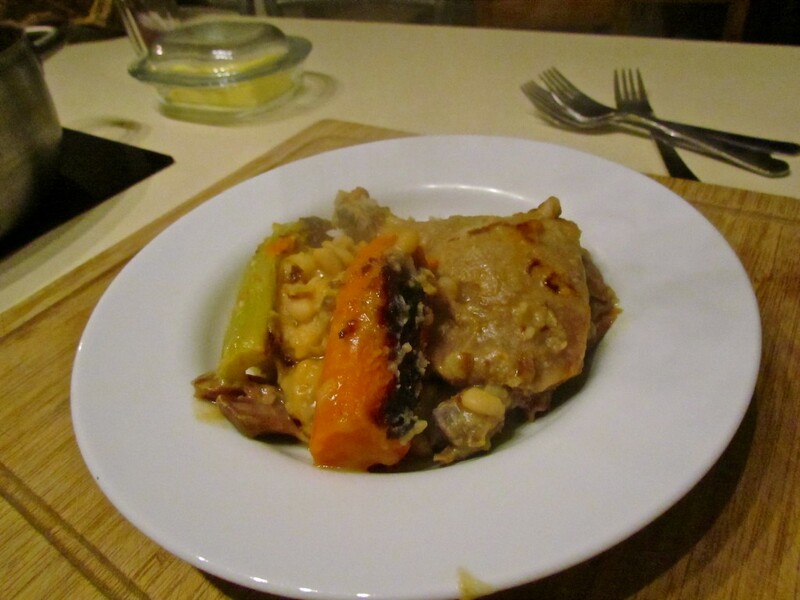 I decided to make my cassoulet a little differently, because I missed the creaminess of the canned version, but wanted it lighter and found a recipe with actual vegetables in the dish. Usually when the beans are ready for the oven, you discard them. But I am not know for wasting anything as healthy as potager from an organic garden. I left them in, and I am glad I did! It gave the meal colour, and a little variety to the chew. It was a more adventurous version than the locals would do. Tomatoes are the controversial ingredient although not traditional in every recipe especially over towards Carcassonne, however in St Jean Minervois, the recipe says bien sur! 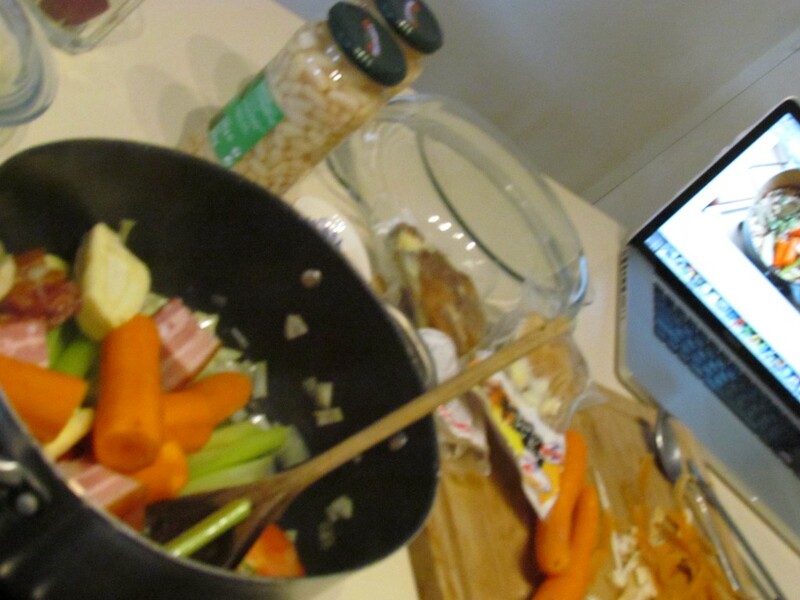 In essence you are cooking the beans in stock with vegetable. This will soften the beans up and the vegetable flavours will transfer to the bean and make them not only edible but sweet and loaded with taste. When you use canned beans, the beans are already soft, so it is more about getting the flavour into them. Here in France we can buy duck confit ready to eat in every supermarket. If you are not so lucky to live in France, duck confit is slowly cooked duck in its own fat. You have to get enough fat to cover the duck and then place in the oven to cook over time. The meat is divine, tender, robust and falls apart in your mouth. Here is a link that shows you how to make it from scratch. Most restaurants outside of France are obsessed with bread crumbs on top and browning them. Their versions are also more like the canned variety. To me this is a cheap way of doing it, and original recipes I read about, bread crumbs and creamy sauces were not the norm but a more commercialized version that the world now recognises as cassoulet. My only folly was to overcook the beans before getting them into the oven. The smells in our house that day were seductive. The meal was a success even with the kids. I made far too much and still have some in the fridge, and it gets thicker as time goes by, so I suggest adding more water. Once the duck and sausages, bacon are gone, you can always make more and add to your plate. Next time, I will spend less time boiling the beans in the pot time, and a longer time slow cooking them in the oven. Voila! Cooking the beans for cassoulet, smells devine! taste better than it looks! Posted on January 16, 2016 January 16, 2016 by EvaPosted in FranceTagged baked beans french style, Black pepper, cassoulet, duck confit, food, France, french cuisine, Garlic, Onion, sausages, Sautéing, Tablespoon, traditional french comfort foods.